This time of year always finds the world in a flurry of activity and excitement. All too often, November finds many of us racing into the celebratory mood of Christmas, without a thought of Advent, that preparatory season of light penance and prayer. But our ancestors in the Faith, not influenced by the pressures of a secular society, happily embraced the prayerfulness of quieter days and were more sensitive to nature’s messages at the close of summer and autumn, and the appearance of death all around in plant life going into the sleep of dormancy. All around us are the symbols of the brevity of life, but also the invigoration of future life. The paradoxes of Christian life! During Advent, let us not neglect to carve into each day’s hours at least some time for silent “connection” with the God Who loves us – so He may instruct and guide us – and reveal to us the wonders of His love and providence! 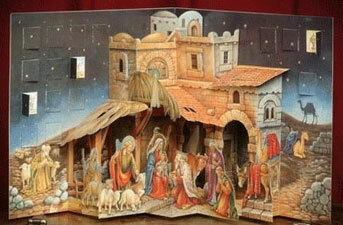 “Advent is a time of being deeply shaken, so that man will wake up to himself. The prerequisite for a fulfilled Advent is a renunciation of the arrogant gestures and tempting dreams with which, and in which man is always deceiving himself. Thus he compels reality to use violence to bring him around, violence and much distress and suffering…Perhaps what we modern people need most is to be genuinely shaken, so that where life is grounded, we would feel its stability; and where life is unstable and uncertain, immoral and unprincipled, we would know that, also, and endure it. “All of life is Advent” – yes, all of life is a preparation, and only a preparation, for the life that comes. How often we lose sight of this most important fact as we go about our day to day activities. All through November we have been reminded of the reality of death as we pray for our Faithful departed; let us not forget to prepare for our own deaths as well during this season of Advent. 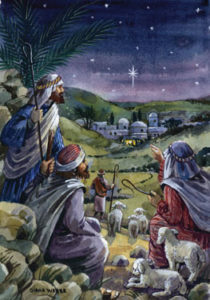 On Christmas we will welcome Our Lord to earth, and we will commemorate and re-live the day the earth saw His face for the first time, an anticipation of the day which on which we hope to see the Savior in the face for the first time. Remember – “All of life is Advent. Please note that we now are making Volume I of the Liturgical Year available (Advent) and hope to continue to offer the volumes separately, making the scholarly work of the joyful and wise Abbot Gueranger more affordable for all. Nothing matches his chapters on “The Mystery of Advent” and “The History of Advent” – as well as all the Sunday liturgies and Saints of December. We could not meet the demand for the first Cross and Crown Series book we presented in our last letter. Remember, these books are out of print and for the most part, rare. We hope to locate more of In Him is Life in the future, but for now, this book is no longer available. The response has encouraged us to find more of these superb books to make available to you. We have found some republished in paperback, and when appropriate, we’ll offer these. About 30 titles were published, and some truly are gone. But the search is on, so occasionally visit our site to peruse these valuable books, which have their own section now on our website. The Advent Wreath for centuries has been a family tradition as a means of preparing for the celebration of the coming of Christ. Though originally the Advent Wreath was hung from the church or home ceiling on ribbons, custom of more recent years permits its use on the dinner table, where the family meets each day. 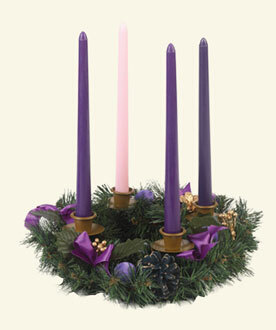 The symbolism of the Advent Wreath is as follows: the round shape of the metal ring represents eternity; the evergreens are the symbol of life immortal; and lights of the candles lit each week of Advent represent the Light of World that is the Incarnate Son of God coming into the darkness of this world. Three purple candles indicate the penitential nature of the holy Advent Season, and the one rose colored candle represents the Third Sunday of Advent’s “mitigated penance” and joyful anticipation mid-season. The total of four candles represent the roughly 4000 years that passed between Adam and the arrival of the new Adam, that is Christ. The head of the family blesses the wreath on the Saturday evening before the First Sunday of Advent. On Sunday, the youngest child lights a purple candle and the special prayers are said. The candle is allowed to burn at the evening meals throughout each week. Another purple candle is lighted on the Sunday of the second week of Advent by the oldest child, with the prayers. The rose candle is lit by the mother on the Third Sunday. On the Fourth Sunday of Advent, the last purple candle is lighted by the father. Thus during the fourth week of Advent, all candles will be burning. 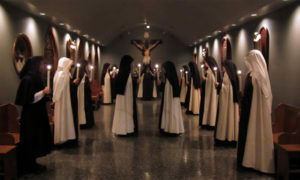 Many different prayers and customs are used for blessing and lighting the wreath, but one of the more common is to use the collects from the Mass of each Sunday. The wreath can also be used on Christmas Day and days following as the center piece with four white or four red candles for the festive meal. Advent Calendars are not nearly as ancient or symbolic as Advent Wreaths, but are another way to mark the days before Christmas, especially for children. Even some of our “oldsters” among the Sisters (60s-70s) remember the custom, either in the classroom or at home, of having an Advent calendar to keep remembrance of the season’s days. Unhappily, we’ve seen Advent calendars featuring modern movie characters or Santa’s reindeer featured, rather losing sight of what Advent is meant to be. But religious Advent calendars can still be found, and we have added many different styles to our website over the years. 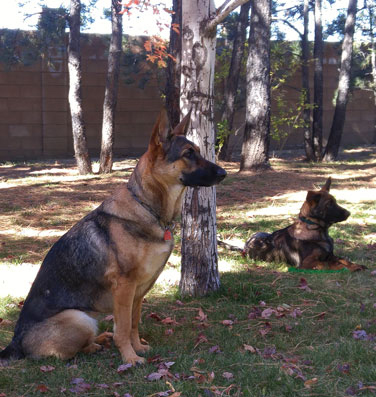 She is Patroness for a very good reason! 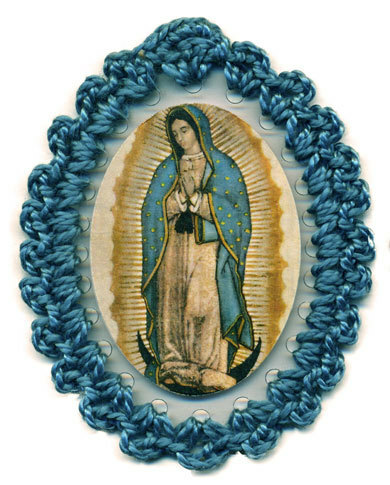 After years of laboring in Mexico with only few converts among the local people, the missionaries turned to Our Lady for help. The answer from Heaven was this apparition, which took place during the days just after the Feast of the Immaculate Conception, December 9-12. At the time, very few of the Europeans realized the full extent and meaning of all the imagery and symbols in this famous picture, but the native Aztecs understood it very well, and 8 million of them were converted just by looking upon it. So much more could be said about the tilma itself, which, not unlike the Holy Shroud of Turin, has baffled scientists for centuries. Its miraculous preservation, the absence of any dye or paint creating the image, and the extraordinary eyes, have been the subject of scientific study, with wondrous discoveries. Those eyes, having been examined by numerous ophthalmologists, are noted to reflect light and images just like living eyes, mirroring the images of the individuals who first gazed upon the tilma when it was revealed by the humble and amazed Juan Diego. Part of the extraordinary story of the apparitions themselves, are on our website. We also recommend the book, Woman Clothed With the Sun. For the telling of the charming and marvelous story of Our Lady of Guadalupe, this book is our very favorite. Our Lady stands in front of the sun and over the moon, showing herself greater than these “gods,” and yet has her head bowed in p rayer, acknowledging someone greater than herself. She is surrounded by mist and clouds, which point to a Divine origin and mission; but she is unmasked, which indicates she is human. Her bluish green mantle denotes royalty. Her hair is loose, which signifies virginity, and yet the black sash around her waist denotes that she is with child. Over her womb is the quincunx flower, the Aztec symbol of divinity of transcendence. The stars of her mantle are arranged to mirror the constellations that were in the sky at the time, but not as they would have been viewed on earth. It is as if the viewer were the sun, or the center of the flower over Our Lady’s womb. The pictorial message was very clear to these people who often used pictographic symbols – the true God, Lord of the universe, was in the woman’s womb. 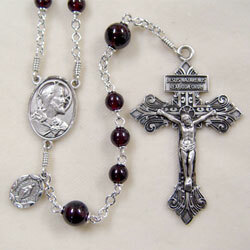 As it was last year, the deadline for ordering a custom rosary for a Christmas gift is December 1st. We will do the best we can for orders that come in after that time, but we will no longer be able to guarantee that you will receive it before Christmas. 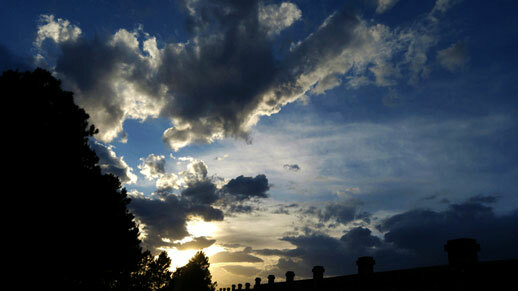 Here in Colorado, winds blow in, out and through the seasons, but especially in autumn and spring. And with all the tall ponderosa pines around the Monastery grounds, those winds blow heaps of pine needles to the ground at both seasons. In Fall, add to those the leaves from our aspens, maples, ash and other trees, and we have quite a pretty, little mess on our hands! Time to pull out the rakes and get busy. Of course, as usual, puppies hamper progress, so after they get their fun running from Sister to Sister, rake to rake, pile to pile, we coax them indoors to get the work done. 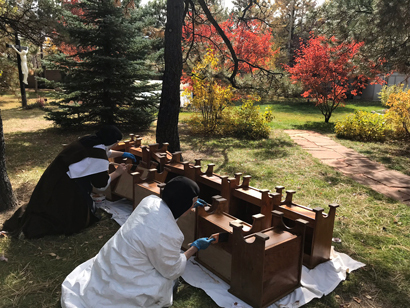 As another tribute to Our Lady of Fatima, we have had a new shrine built, moving her image closer to the Monastery building and surrounded by trees to make a more secluded cove for prayer. Along with the shrine, we’ve planted a few more blue spruce and Austrian and bristlecone pine trees to provide better enclosure from the nearby growing housing development. We have just a bit more garden work to do to wrap up things for winter. The mostly mild November days will soon come to an end, and winter will come in earnest. We continue to work on our sewing and embroidery, of course. We are actually in the middle of our biggest project yet. But we can’t tell you more about it yet. Sometime in the spring, all will be finished. Meanwhile, we face hurdles, figure the best way to handle them, then leap one hurdle only to approach others along the way. Creativity, ingenuity, and just plain perseverance are getting us through! But of course, prayer above all. Our two favorite invocations are, “Our Lady, Queen of sew-ers,” and “Our Lady, Queen of embroiderers! The aromas of Christmas bakery are more frequently filling the house these days. Our Kitchen Sister insisted on getting us started on our Christmas gifts a few weeks earlier this year, in hopes that we’ll have everything made in good time for the delivery day to our good friends in the city who are of such help to our Community. Health professionals, shoppers, handymen, and helpers to Carmel in so many ways – how better to thank them than with the fruit of our creative labors in the kitchen? Of course, our grateful prayers accompany them throughout the year, but the bakery is a small token of our appreciation. Besides, the Sisters enjoy this one time to make old and new favorites to share with these good friends. We close with our prayers for a Blessed and peaceful Advent season. Let us strive to make all of life – all of our daily life – an Advent for Our Lord’s moment-to moment coming to our souls by His grace! P.S. And we also wish all of you a very Happy Thanksgiving! We all have so much to be thankful for.